William T. Snyder, 1974. Photo courtesy of Joseph and Margaret Snyder Sprunger. William T. “Bill” Snyder, long-time Mennonite Central Committee executive, was born 4 December 1917 in Altoona, Pennsylvania, the son of William D. and Susan Gorman Snyder. His father worked for the Pennsylvania Railroad as a foreman, and the family attended Memorial Mennonite Church, an Eastern District congregation in Altoona. In 1944, William married Lucille Steiner, daughter of Calvin and Luella (Burkholder) Steiner. They had three children, Margaret Jean, Sharon Christine and William David. William T. Snyder died 2 October 1993. Upon graduating from high school William attended the Altoona School of Commerce for two years before transferring to Bluffton College. At Bluffton he was active in a variety of activities before graduating in 1940 with a degree in business administration. William served on the editorial staff of the student newspaper, played catcher on the baseball team and was active in the Men’s Gospel Team. He was president of his class and given the Most Popular Man award. 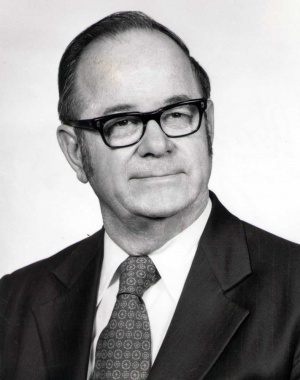 He was elected to the Bluffton College Board of Directors and served in that capacity from 1958-1988. In 1981 Bluffton College conferred on him an honorary doctorate degree. The following year it named him Outstanding Alumnus. On 12 August 1944, William was married to Lucille M. Steiner, also a Bluffton graduate. In 1943 William entered Civilian Public Service (CPS) at Luray, Virginia. Here his administrative gifts were recognized with the result that he was invited to a position in the Mennonite Central Committee (MCC) treasurer’s office. Soon his duties were expanded to direct the dairy testing division of CPS. After being discharged from CPS, William was invited to continue with MCC as director of the newly created Mennonite Aid Section to facilitate the resettlement of over 15,000 European refugees to North and South America. In 1955 be was named Associate Executive Secretary and in 1957 he succeeded Orie O. Miller as Executive Secretary of MCC, serving in that position for 25 years. William Snyder was MCC’s longest-serving Executive Secretary. Under his leadership MCC made the transition from a relief and refugee settlement program with a major European concentration to a global program with an expanded community development emphasis. The number of MCC-appointed workers increased to 497 serving in 58 countries. Much of this growth took place in Africa in the aftermath of the colonization era. Snyder had a major role in the creation or direction of MCC-related ministries, such as Mennonite Mental Health Services, Mennonite Economic Development Association, Mennonite Disaster Service, Mennonite Indemnity, Menno Travel Service, and the Association of Mutual Aid Societies. Snyder’s service went beyond MCC and included the board of Church World Service. He was one of the founders of International Voluntary Service and served on its board for more than 20 years. For many years he represented MCC on the Washington, D.C.-based National Service Board for Religious Objectors. William Snyder gave first priority to activities related to the wider Mennonite church. He and Lucille were charter members of Bethel Mennonite Church, Lancaster, Pennsylvania, established in 1947 by Eastern District Conference. As active members of the congregation, Lucille served as organist and William as Sunday School superintendent and teacher. William was also active serving on boards in both the Eastern District and General Conference Mennonite Church. In the 1940s and 1950s he served on the Publication and Historical Committee and the Peace Committee of the Eastern District. From 1953-1965 he served on the General Conference Board of Christian Service and the Executive Committee. In addition he served on the boards of the Schowalter Foundation and the Mennonite Weekly Review. After retiring from MCC in 1982, he and Lucille continued to live in a modest house across the street from what was long known as MCC’s Main House. He died on 2 October 1993 at the age of 75. Lucille died in 2003. William Snyder had an above average grasp of finance, business administration and international affairs, but he is best described as a visionary servant leader who served the church faithfully and who willingly shared the limelight with others, especially youth. William T. Snyder papers. Mennonite Church USA Archives-Goshen, Goshen, Indiana. William T. Snyder papers. Mennonite Central Committee Archives, Akron, Pennsylvania. Includes transcribed interviews of Snyder in the 1980s by Robert Kreider. In 2010 these remained restricted access. Stoesz, Edgar. "Snyder, William T. (1917-1993)." Global Anabaptist Mennonite Encyclopedia Online. 2009. Web. 25 Apr 2019. http://gameo.org/index.php?title=Snyder,_William_T._(1917-1993)&oldid=104861. Stoesz, Edgar. (2009). Snyder, William T. (1917-1993). Global Anabaptist Mennonite Encyclopedia Online. Retrieved 25 April 2019, from http://gameo.org/index.php?title=Snyder,_William_T._(1917-1993)&oldid=104861. This page was last modified on 7 December 2013, at 14:39.